At first glance, this attachment looks nearly identical to the Singer Professional Buttonholer--not only sharing a similar shell but internal mechanisms as well. And like the top loading Professional Buttonholer, this attachment only works with zigzag capable machines (older buttonholers loaded from the bottom and work with straight stitch only machines). The attachment itself, merely traces the outline of your monograms and relies on your machine's stitch width to give it girth. But before we get too far into the details of this attachment, let's take a look inside the box! 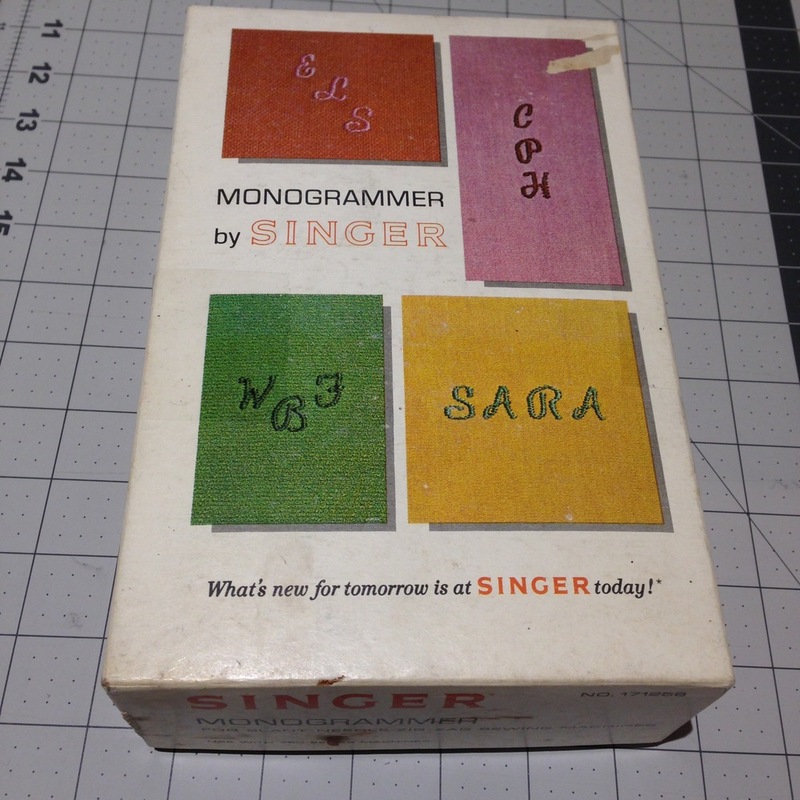 The Singer Monogrammer comes in a box packed with goodies including an instruction booklet, a plastic monogram stencil guide, a thumbscrew, needle plate cover and of course, 26 cams! Unlike the Deluxe Monogrammer, this one was sold with a complete set of cams, which is quite a relief for all you completionists out there. But before you go running to buy one of these, please be aware that you need to find the model that comes with the correct throat plate for your machine. These came with 3 different plates, the two slant shank plates look nearly identical and may cause some confusion. As this attachment was sold around the same time the Touch & Sews were coming out in full force, you'll find an abundance of these that come with feed cover #507661. If you're using a Rocketeer or a 401a, you'll need Feed Cover #161825. The plate on the left is the Touch & Sew Plate and the one on the right is for the 401 and 500 series. The last feed cover plate, #86748 is used for low shank machines. When in doubt, check the bottom of the box to see which machine the attachment is for. If you're still having trouble finding the correct model for your 400 or 500 series machine, don't fret, you can always pick up a Professional Buttonholer that has the correct plate as well. You can see that the box below is for a Touch and Sew version of the attachment. Here are some closeups of the circular cams. Each cam has a different shaped groove that the Monogrammer uses to track the pattern. They are also marked with a starting line to ensure that your monograms start in the proper position. Open the hatch at the top of the Monogrammer and load the cam in, ensuring that the metal finger sits securely in the cam groove. Here's a little tip, if for some reason, your monogrammer doesn't feed properly, it's possible that the cam isn't loaded in securely. The cover applies pressure onto the cam via the black plate mounted on the underside of the lid but only when the lid is closed securely. You can always help it along by gently holding the cover down with your finger while running the machine, this will lock the cam finger in place and keep things rolling along smoothly. Next, adjust the stitch density (length) with a lever and locking dial on the left of the attachment and use the lever on the right to set the start position of your cam. I'll be demonstrating this on my trusty Rocketeer. Singer suggests that you set your stitch width to 2.5 for starters, but I found that 3 worked better when doing this demo. You'll need to remove your sewing foot and throat plate before you install the Monogrammer. When installing, be sure the forked arm fits over the needle clamp on your machine, then use the included thumb screw to mount the Monogrammer to the presser bar. Once the attachment is in place, pop open the cam door and flip the disc positioner lever until the cam starting line lines up with the disc latch start-line indicator shown below. Now for the tricky part! Sewing one monogrammed letter is easy, but lining up 3 takes a bit more preparation. If you look closely, you'll see that each letter on the included plastic stencil has a hole in it. You will need to mark point on your fabric as this is your starting needle position. Just like the Deluxe Monogrammer, this works best on a stiff fabric, a stabilizer will be absolutely necessary on thinner materials. I'm using 4 layers of muslin. Use the vertical lines on the box around each letter in your stencil guide to line up with the guide lines on the attachment. Don't forget to check that your needle is positioned over the marking you just made. I found this to be the most time consuming part. 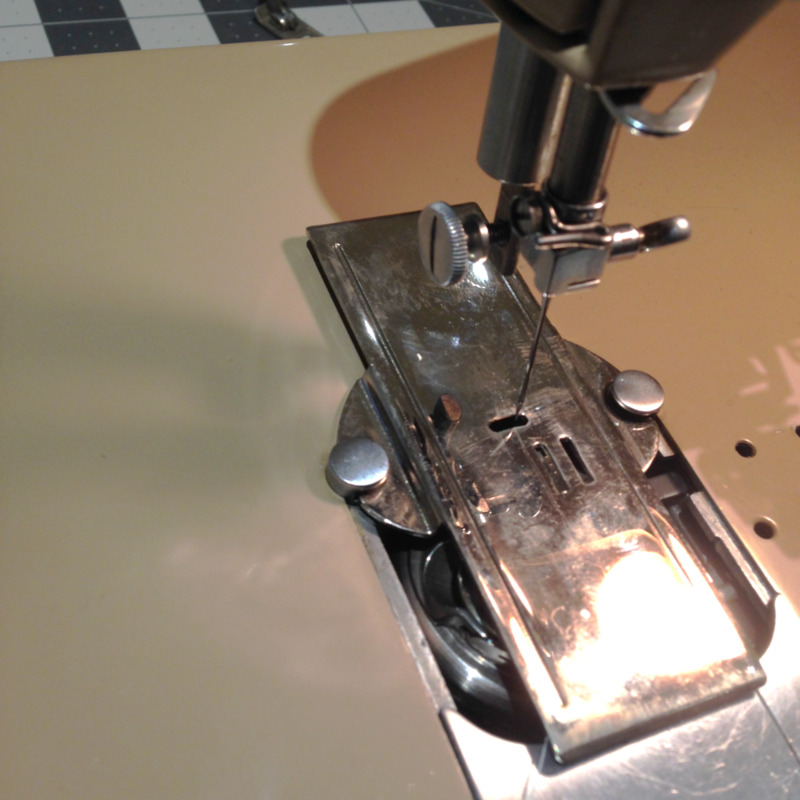 Once positioned, carefully remove the plastic stencil and lower your needle into the fabric. Take a couple stitches by hand to secure the thread before stepping on the pedal. You'll need to go fairly slowly for this attachment to work properly. Sewing at full speed, caused too much vibration which shifted the letters a small amount. The letters are fairly small, about 1/2 inch tall. Even a small shift can cause enclosed letters (like the letter A) to fill up the already tiny hollow space. It's recommended you stitch each letter twice to fill out the monograms. In order to do so, you will need to reset the cam position to the start before stitching again. Once you're satisfied with the letter, remove it and use the stencil to locate the position of your next letter. Repeat the same steps for each additional letter. TADA!!! Here's the finished monogram! So how does this vintage attachment stack up to it's bigger brother? Truth be told, I prefer the Deluxe Monogrammer because it feels much easier to use. No doubt, the larger 1 1/2 inch size makes positioning the letters much easier. I found myself spending more time fiddling with the stencil when using this attachment than on the Deluxe. This attachment is also much more fiddly and had to be run at nearly half the speed of the Deluxe to make a decent monogram. That being said, I can't argue with the versatility of the smaller monograms this attachment makes. I sew mostly garments and small items, so I foresee getting much more mileage out of this attachment than the Deluxe Monogrammer.